I’ve never fully got my head round daylight savings time. I just assume it’s got something to do with Einstein’s relativity, or possibly cows—or possibly not. When I was younger it was a source of some irritation every six months to manually twiddle every clock in the house forward or back an hour; now I find I only have three clocks that require a manual adjustment, and one of those is in my car. All the others are apparently sentient, and probably have an opinion on Brexit. Even the central heating just “knows” the correct time. I feel that the AI enslavement of humanity is creeping closer, one radiator at a time. In gansey news, it’s been a heads-down just-get-on-with-it kind of week. It’s week two of my perhaps rash attempt to knit two ganseys simultaneously, and already the navy gansey is pulling ahead. The is partly because it’s more of the Wendy chunkier yarn, so there are fewer stitches and rows. But I’m also just knitting it more. The Wick pattern is a long-term project, just a couple of rows a night at the moment. Hi Lois, “… you have nothing to lose but your choke chains”…? I have long railed against changing the clocks twice a year, and have been heartily laughed at for my troubles. My opinion is, if you want an hour more daylight at the end of the day, rearrange your schedule and get up an hour earlier. But leave me out of it. As to dogs, I fed mine at 5 pm standard time, 6 pm daylight time. They were all happy. I have a gansey question. I’ve started the Cordova gansey in Beth Brown-Reinsel’s book Knitting Ganseys. I’m using the Frangipani yarn you wrote about a while ago, I am getting the correct gauge with the correct US 1.5 needles (2.5 mm). I am just starting the yoke pattern. I have managed to bend the first needle I chose (an Addi-type metal circular); last night, I broke its replacement (Knitter’s Pride Karbonz circular) at the join of the needle and cable. In my 60-plus years of knitting, I have broken needles before, but very rarely and never in the same sweater. Any thoughts on what I might be doing wrong, before I embark on needle number three? I am very new to your writing, and am enjoying it mightily! I call my sister (a non-knitter) to read bits to her, and she loves it, too. This gansey I am making is the first sweater I have made for myself in three decades, and I am delighted with the way it looks so far. Thank you for reminding me of these fascinating patterns, and sharing your life with us! I thought it was just me. Started my first Gansey and am using 3mm Sympfonie interchangeables and have managed to break 2 needle tips and haven’t reached the yoke yet. After the first breakage I managed to find a supplier in Brazil and bought another set, so at the moment I have 1 whole set and 2 broken tips. I think it has something to do with the tight tension. Am now determined to finish the sweater with cheap fixed circular needles. Hello Camilla, great to hear from you! I have broken needles before, but not for a few years. There does seem to be a pressure point at the join between the metal and plastic. A tight gauge can lead to stitches getting snagged at the join sometimes, but I don’t think it’s you – I think it’s just bad luck. For what it’s worth I use Hiya Hiya needles these days and they seem pretty good to me. I am a knitter in Canada and I have used Addi needles for lace projects but I feel the tips of them are more fragile than a less expensive generic needle and Addi isn’t my choice for the Frangipani ganseys I’ve knit on 2.5 mm needles. My choice is Knitpicks metal circulars, I’ve knit six ganseys and, knock on wood, none have broken – yet. 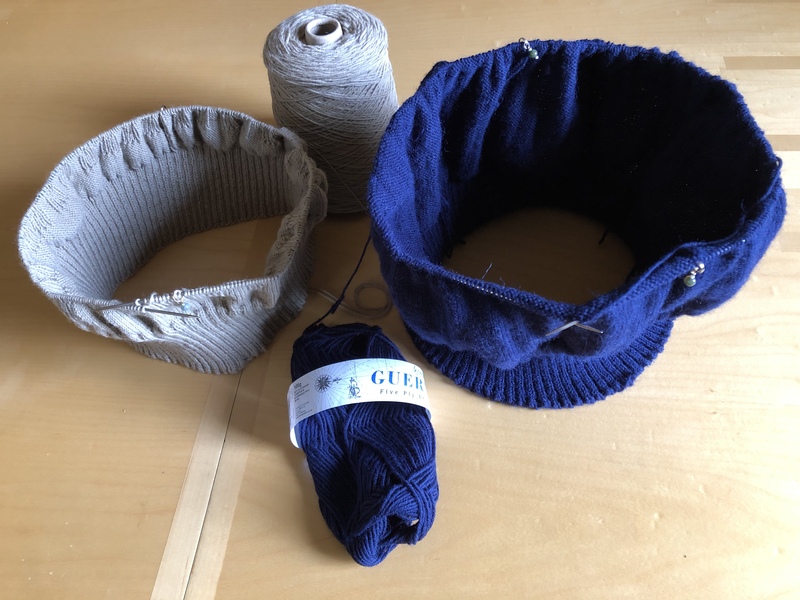 I also use the Knitpicks circulars with the wooden tips and they have lasted through several ganseys and a host of other knits, from lace to bulky weight. Hi Dave, it sounds like you’ve wandered into a Monty Python sketch featuring “confuse-a-cow ltd”..! We changed the clocks a while ago over here and the last one I changed was the one in the car, a week later. I like the huge stone geometry balls reproducing the ancient ones which were much smaller. Have you any gansey patterns for Dunbar and Eyemouth?? Reading an analogue clockface should be put on the curriculum and on the exams. My niece taught herself to tell time by the analogue clock when she was three years old. It’s not hard.